8 February 2010, at 12:07p.m. NETHERLANDS - After working with three generations of Pas Reform incubators, Schotman Hatcheries is expanding in Europe with Smart modular single-stage incubation technologies from Pas Reform. The hatchery, owned by father and son, Aloys and Erik Wolterinck, produces one million birds a week. Backed up by strong performance over many years with Pas Reform machines, the Wolterincks also selected Smart incubation technology for the benefits of modular single stage incubation in reducing the hatch window. Aloys Wolterinck explained: "We balanced the benefits when making our choice for the latest installation. While the older systems demand more attention and skill from the hatchery manager, the new Smart systems run independently and provide much more information to support optimised development for the broiler chicks." With 100,000 parent stock (PS) females and its own males, the Schotman operation also incorporates a rearing farm for 100,000 birds, with a further 300,000 PS under contract at farms located strategically in different disease defence compartments of the Netherlands and Germany. This measure secures production in the event of a serious infectious disease break-out, with its inevitable restrictions on the movement of flocks. The Schotman's excellent reputation stems from the hatchery's absolute commitment to chick quality. 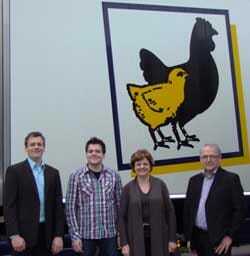 Appreciation for the quality of Schotman broilers has, says Aloys Wolterinck, been demonstrated not only by a constantly growing customer-base in the Netherlands and Germany, but also by an increasing number of hatcheries further afield, who have contracted the family-run business to hatch eggs for them, or to deliver broiler chicks to fulfil their own customer's order requirements. Pas Reform CEO, Bart Aangenendt, commented: "Schotman Hatcheries' uncompromising dedication to quality has gained recognition and Certification from many national and international quality control bodies throughout Europe, including Food Quality Certification in the UK. "This is exactly the kind of environment that Smart was designed for. We are delighted to continue our long association with the Wolterincks – and look forward to supporting their continuing growth and success for many years to come."